The Extreme H2O contact lens range offers the right solution for every eye: Extreme H2O Standard, Extreme H2O Thin for sensitive eyes, Extreme H2O Toric for eyes with astigmatism, and Extreme H20 Xtra for newcomers to contact lenses. 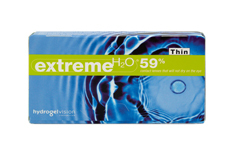 Extreme H2O lenses has excellent water retention properties, meaning that the eye is constantly provided with moisture. As a result the eyes do not dry out and become irritated, and the 54% water content can be best maintained. Extreme H2O contact lenses guarantee comfort for the wearer, even in air-conditioned spaces and during long periods in front of the computer. Mister Spex offers Extreme H2O lenses in two different lens diameters: 13.6mm and 14.2mm. This means that people with eyes of all shapes and sizes can enjoy the benefits of Extre,e H20 contact lenses. The low diameters a better supply of oxygen to the eye. Extreme H2O lenses are very highly tolerated by the eyes and a joy to wear! Extreme H2O Thin is a lens with a super slim and streamlined design. The contact lens does not apply pressure to the eye, enabling a more comfortable fit - ideal for people with sensitive eyes. In addition, Extreme H2O Thin contact lenses feature the natural ingredient mucin, which helps to regulate the amount of moisture in the eye and prevents dryness. Water retention is also extremely high in these high performance monthly lenses. 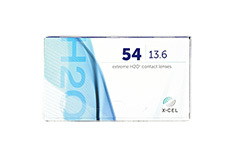 Extreme H2O Toric is a toric soft contact lens that has been specially developed for eyes with astigmatism. The Extreme H2O Toric also features high water retention properties and parameter stability, meaning that wearing the lenses for a long time does not affect their tolerability. Hioxifilcon D, the material from which Extreme H2O Toric lenses are made, is extremely effective at retaining moisture in the lens. Mister Spex offers cylinder measurements of -0.75D and -1.25D. 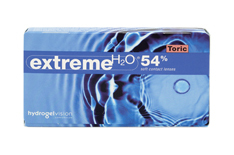 Extreme H2O Xtra is a particularly strong contact lens. The centre of the lens has been increased to 0.14mm, which makes it especially easy to insert the lens into the eye. Extreme H2O Xtra lenses are suitable for first-time contact lens wearers, as they feature a tearproof structure and are not easily damaged during the care and cleaning. This monthly lens also has high water retention capacities, provides longer lasting comfort and constantly clear vision. The non-ionic material mucin prevents the formation of protein and lipid sediments.